Fewer than one in five of the provisional election candidates nominated by Fiji’s three major political parties are women. FijiFirst, SODELPA and the National Federation Party (NFP) have now revealed their full list of nominees for the polls next month. The three parties have nominated 28 women candidates between them for the 51 seats – FijiFirst has 11, the NFP 10 and SODELPA has put forward seven women to contest the 14 November polls. 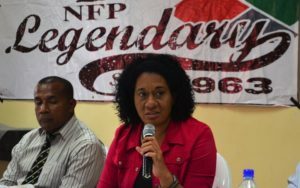 Seni Nabou, one of NFP’s two female vice-presidents, said women’s own beliefs were the main barrier to their more active participation in politics. Women often doubted or downplayed their abilities and the value of what they could contribute to national politics and development, Ms Nabou said. “A lot of that can be attributed to stereotypes, culture and tradition, family obligations and religious beliefs,” she said. Ms Nabou, however, said she had seen a change in behaviour from the last elections and rural women had been attending political meetings. The party was trying to ensure women were active players, “such that they will pause sessions to ensure that women can listen and participate or ask the men in the meetings where the women are”. The NFP has put forward three more female candidates this year than for the last election in which eight women were elected to parliament out of a total 36 female candidates. Fiji also had its first female Speaker of Parliament, Jiko Luveni. There have been continued calls from women parliamentarians and women’s civil society organisations for temporary special measures to get more women into the legislature, although Dr Luveni told the Fii Sun in 2016 the majority of women did not want such a system. The latest voter registration figures announced by the Fijian Elections Office revealed 637,527 Fijians were eligible to vote, of which 316,431 were women. Political parties have until 15 October to nominate all their candidates.